The third episode of Chu★Cast is here! Jon Ingoglia (@JanaiBlog) of JanaiBlog joined me for New York ComicCon / New York Anime Festival 2010, and he was also nice enough to join me on my podcast to discuss our experience! We delve into the good and the (very, very) bad about the merger of these two fantastic conventions, as well as share stories of all the sights, sounds, panels, and merchandise we came across during our travels. We also share some ideas for improving the convention next year, and chat about some of the hottest industry news to come out of the con. Check it out! If you want to download this podcast, click on the Mevio player to go to the episode’s site, then click the down arrow on the bottom of the Mevio player to download the MP3. Enjoy! This was my second year to New York Anime Festival, but my first experiencing New York ComicCon, and let me tell you, it was intense! I was bubbling with excitement over the many guests and panels that were going on, and it certainly did not disappoint! So, let’s go through each aspect of this powerful convention duo! Once again the con was held at the Jacob K. Javits Center in New York. 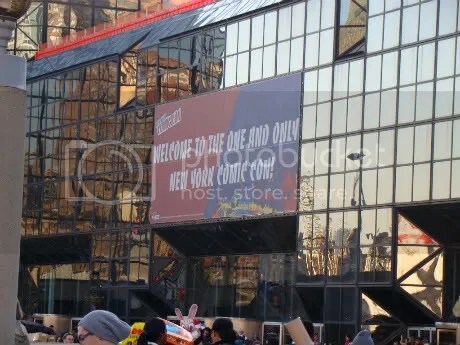 While only a small portion of the building was used for NYAF last year, both cons being put together forced them to truly utilize the entire building this year, and boy did they ever! The weather was beautiful, so taking the train from Long Island to Penn Station was a breeze. Then it was just a short cab ride over to the convention center! I was very impressed with how the con was handled! Although it was frantic, the staff, for the most part, had everything under control. The energy at the con was intense and vibrant, and everybody was running around excited to see all that there was to see. Unfortunately, as time went on the cracks began to show in the convention planning, especially on Saturday. Friday morning it was announced that they were no longer selling weekend or Saturday passes. When the absolutely ridiculous amount of people squeezed themselves into the convention center on Saturday, it was clear why they had made that decision. Also, the Anime Festival part of the con were crammed into the sidelines, with most of the anime-related goodness condemned to the basement, which was sad and made it rather tedious to travel from NYAF panels to NYCC panels. Another issue was food. While I myself don’t condone eating at a convention as it is rather overpriced, it was downright impossible for me to get outside for food when I had to run from one side of the building to the other. In the middle of the building was the food court, but unless you had a good hour or two on your hands, waiting on the insanely long lines wasn’t even worth your time. More than once I went hungry and thirsty this weekend. The biggest issue for us bloggers, however, was the lack of internet. Sure, you could get internet, if you wanted to pony up $70 for the weekend, or $30 for the day. I cringed as poor, sweet Gia from Anime News Network paid for this service so that she could do what she had to. Most people were satisfied using their 3G service, but the reception was terrible in the convention center, which made it pretty much impossible to post immediate updates and news. My personal biggest issue, especially since my days were jam-packed with stuff I wanted to cover, was the poor scheduling. I don’t think I attended a single panel that started on time, although many of them did wind up ending on time and cutting off the panel early. I missed out on several panels and signings because of this issue. I think the problem was that there was so much going on that they didn’t have time to schedule 15-minute breaks between panels like many conventions do, which gives time for the previous panel to clear out and for the next one to set up. Besides that, the con goers actually meshed rather well together! Attendees from one side curiously checked out samplings from the other, and it seemed to expose a lot of people to new things. Everybody got along well and that made for a positive atmosphere overall. Most of the qualms I had with the con resulted from the sheer number of people, which is something that the con staff will hopefully have under better control next year. So, at the end of the day, the con attendee’s played nice with eachother, but the cons themselves did not. There needs to be a much better balance between both cons next year in my opinion. The panels were fantastic this year! For the first time I got to attend Disorganization XIII’s Spoiler: The Panel, and it was hilarious! I also got to attend a panel on culinary manga, as well as panels on the hit CW shows Nikita and The Vampire Diaries, which were chock-full of stars. One of the top panels for me, however, had to be the Robot Chicken panel, which was attended by Seth Green and co-creator Matt, Seth’s wife, and special guest Macauley Culkin, who will be starring in their Christmas special this year (which, by the way, will be a full hour long!). We also got sneak-peek footage of the special, as well as of their third Star Wars parody and the upcoming 5th season, which will include an “epic” 100th episode. Another great panel was one celebrating Butters of South Park fame. Trivia games were played and tons of swag was thrown into the crowd, making for a fun and energetic half hour! On the work side of things, I also attended the Bandai and FUNimation panels (you can read my round-up of the announcements they made here), which were both exciting. The only panel that didn’t work was Anime Clue, and that was purely an error of location. It took place on the Variant Stage, which was located in the ComicCon Artist’s Alley. The noise from the Alley made it difficult to follow along with the panel, and that killed the audience participation. 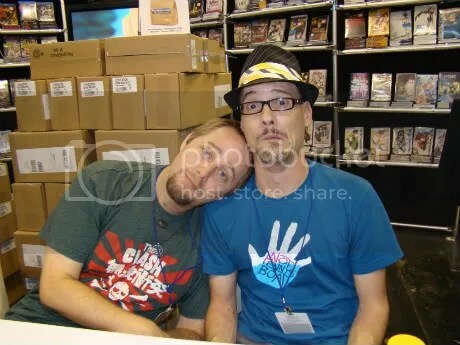 Taliesin Jaffe and Chris Bevins show how close their friendship really is as they promoted Sengoku Basara at the FUNimation booth. There were a ton of incredible guests at the con. While I didn’t even attempt to try and meet the big names like Stan Lee and Bruce Campbell, I did meet my fair share of people I was excited to see. The first three I met were Taliesin Jaffe, Chris Bevins, and Michael Sinterniklaas, who were all there with FUNimation promoting the new Sengoku Basara game, which looked like a ton of fun! I got to chat with them until I got kicked out of the booth so they could do their signing. I also got to meet Stephanie Sheh, who signed my cover of Persona 3: FES, as she plays Metis. There were a few people I sadly didn’t get to see, however. I showed up to the Bandai booth 2 hours early to meet Crispin Freeman, but the line to do so was already wrapped around the booth and out the dealer’s room door, so I didn’t even attempt it. I also wanted to meet the Vampire Diaries cast, but when I showed up 2 1/2 hours early to the signing, there were already over a thousand people in line, so again, I didn’t even try. 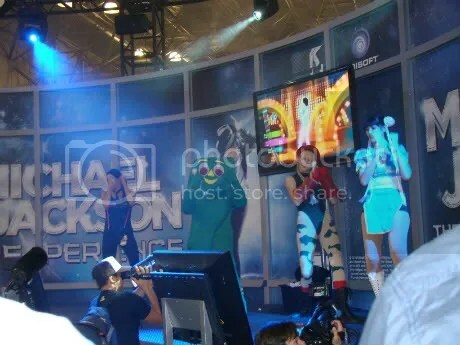 Gumby, Chun-Li, and Cammy played The Michael Jackson Experience at the Ubisoft booth! The dealer’s room (called the ‘exhibit hall’) was a double-edged sword. It was full of incredible vendors and sights to see, but it was laid out poorly. They shoved all of the anime-related booths against one wall, and that one aisle was absolutely impossible to move through because it was so crowded. There were tons of computers at the Square Enix booth where people were playing Final Fantasy XIV, and the gigantic Wii booth had playable versions of Donkey Kong Country Returns and Kirby’s Epic Yarn. The Sega booth had a playable version of Sonic Colors, which looked AMAZING (yes, a GOOD Sonic game!). They also let me into a special room in the middle of their booth where I got to see a sneak-peek at the making of their upcoming Thor video game. It looked great and was extremely true to its Norse Mythology roots, which greatly impressed me. There was also tons of swag that was being given away. I didn’t grab much since most of it was given away by comic book vendors and I’m not a huge comic book fan, but I did get a few cool things. Manga Entertainment had a booth and I got some free pins from them, and I got a Golden Eye 007 lanyard from the game’s booth, which was handled in a really cool way; they had the game playable, and they let people play in groups of four. Whoever won the game got a free t-shirt! The line to play it was long, so I only got to observe, but it looked fantastic! I also snuck a peek at a playable demo of the XBox 360’s motion sensor, the Kinect. It looked like it was responding well, but slowly. I couldn’t get close enough to try it myself, of course. The best part of the dealer’s room for me, however, was the Disney booth. They had a playable version of Disney Epic Mickey, and I was lucky enough to get a quick interview with one of the game’s programmers, Sean Barton! Check it out! All in all, New York ComicCon / New York Anime Festival 2010 was a great con with plenty of room for improvement, but that was expected for their first time running a convention of this size. I was absolutely enchanted by it, especially by the exhibition hall. I have never seen anything like it before in person, and the energy of the dealer’s booths alone is going to ensure that I will do my best to attend again next year! Check out my YouTube Playlist of all the videos I took at the con, including a live drawing session with Misako Rocks!, voice acting warm-ups with Veronica Taylor, and an impromptu K-ON!! concert starring Christina Vee! Check out my photo gallery of all the photos I took during the con! Listen to my podcast on the con, featuring Jon Ingoglia! As a final bit, check out some other great reviews on the con from some fantastic writers! Today was a rather exciting day for us anime fans, as Bandai Entertainment and FUNimation Entertainment had some exciting news to share with us! Here is a round-up of my favorite news of the day! Bandai introduced us to their new online store, chock-full of exclusive titles such as Gundam Unicorn DVD 2 (November 12th), A box set of The Melancholy of Haruhi-chan Suzumiya and Nyoro~n Churuya-san, Crunchyroll’s first DVD release 5 Centimeters Per Second, and much more! They also announced a re-release of Mobile Suit Gundam with an English language track for their Anime Legends collection, as well as a bi-lingual K-ON!! release for Spring 2011. Also hitting around that time will be a release of The Disappearance of Haruhi Suzumiya. What excited me most however was a blu-ray release of The Girl Who Leapt Through Time! The music in K-ON!! will not be redone in English. Ever. The Lucky Star manga did indeed have a printing delay for the sixth volume, but it is ready to ship and volume seven is right on schedule. FUNi announced a beta version of their new website that you can go and sign up for right now and will be starting soon! They described it as “a social networking site for all your anime needs.”. There will also be an Elite membership that will involve early access to English dubs, commercial-free online anime episodes, and more! The price for this service has not yet been determined. Kaleido Star is slated for release November 23rd, and the classic anime remake Birdy the Mighty: Decode will be out October 26th. Also, the complete series boxset of Sengoku Basara will be out October 12th! Coming out a week later on October 19th is the Eden of the East complete series boxset. Another exciting piece of news is that a new complete series box of Trigun is on its way, and for a price that is MUCH lower than the original gigantic box, $49.98! This will be out October 26th. Another juicy bit is that Neon Genesis Evangelion 2.22 You Can (Not) Advance will be out in 2011 with a possible theatrical release! But by far the most amazing news for me was the announcement of the acquisition and English dub cast for Summer Wars! It’s slated for Spring 2011, but in late 2010 they will be having a theatrical release of it that will span from New York to Los Angeles! I will definitely be seeing it! So there you go! Keep tuned in to the blog for more NYAF / NYCC 2010 coverage! I am excited to officially announce here on the blog that I will be attending New York ComicCon/New York Anime Festival 2010! I will be running around the convention center seeing all that I can see to cover it for the blog, so I thought I would list some of the panels that I plan on attending. If you happen to attend the same panel or see me at all during the con, feel free to come up and say hi! I’m always up for meeting fellow fans and bloggers! 1:30 – 2:00pm Variant Stage, Opening Ceremonies – I couldn’t properly cover this con without attending the opening ceremonies!! 2:15 – 3:15pm Room 1A15, Writing Action Packed and Character Driven Stories – I am always up for more tips and tricks on writing great stories! 4:15 – 5:15pm Variant Stage, Anime Clue – A Clue mystery, anime style? I am THERE! 5:45 – 6:45 Room 1E13, Aniplex – I am excited to see what new stuff Aniplex has in store! 6:45 – 7:45pm IGN Theater, Robot Chicken – I am a HUGE fan of Robot Chicken, and with Seth Green himself there, I really don’t want to miss this! 7:30 to 8:30pm Room 1A15, Fantasy Writers Panel – I couldn’t very well pass up this panel! Fantasy writing, for those that don’t know, is my life’s dream, so I am very excited for this one! Yes, I am aware the above panels run into each other a bit. I will most likely either leave the Robot Chicken panel early, or just be late for the Fantasy Writers panel. 8:30 – 9:30pm Room 1E14, DramaFever presents Asian Entertainment Trends in American Pop Culture – This is always an interesting topic to me! I look forward to being a part of a discussion on how Asian media influences American culture. 11:00 – 12:00pm Room 1E13, Bandai Industry Panel – No explanation needed!! 12:15 – 1:15pm Room 1E13, FUNimation Industry Panel – No explanation needed here, either! I hope to see ALL of you here!!! 2:30 – 3:30pm Variant Stage, Uncle Yo – Uncle Yo is a hilarious otaku comedian and a lovely acquaintance of mine! I run into him at just about every convention and he tried to take me home as his prize at Out-Of-Time Productions’ The List: The Panel at Castle Point Anime Convention earlier this year! You can check out his website here! 7:45 – 8:45pm Room 1E13, The Best (And Worst) Games From Japan That You’ve Never Heard Of – As a gamer, this greatly interests me! I am pumped!! 11:00 – 12:00pm Room 1E13, Castles, Forests and Bath Houses: The Worlds of Hayao Miyazaki – I am a huge fan of Hayao Miyazaki; Spirited Away and Howl’s Moving Castle are two of my favorite movies of all time! I have a potential issue here: it was just confirmed that the cast of The Vampire Diaries is going to be at NYCC around this time! I’d have to miss half of the Miyazaki panel, but I have a long-standing love affair with the Vampire Diaries books and cast members, and I will gladly miss this panel to have a chance to meet them, if possible. The real issue is that many of the NYCC guests are charging major money to even get a chance to meet them, and with the popularity of vampires nowadays, it will probably be next to impossible to get a chance to meet these fine actors, even if these vampires DON’T sparkle like a bunch of fairies. I’ll have to play this by ear! 12:00 – 1:30pm Room 1E12, Anime Press Your Luck – Another great panel run by the wonderful people at Disorganization XIII! You gotta check it out! There are the panels that I am 99% sure I will be attending, however that can change. Drop me a line if you’re going to be at any of these panels, and remember, don’t be afraid to say hi if you see me! In fact, I decided to film a video talking about some of my plans for NYAF/NYCC, as well as showing off what I’ll be wearing so you can recognize me. I also decided to unveil the very first Chu★Blog business cards!